Dr. Anderman’s insightful report analyzes Tesla’s success to date, the benefits and challenges associated with the Model 3 and the Gigafactory, and the impact Tesla is having on automakers, battery producers, and the future of the EV industry. Anticipate the OEM’s response to Tesla’s success. Explore Tesla’s potential impact on the xEV battery supply chain. Stay abreast of the technology and trends in the EV market. Use the Report’s insightful EV battery technology cost and market assessments to guide your investment decisions. 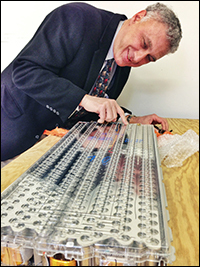 Dr. Anderman inspects a Tesla battery module prior to its electrical testing.